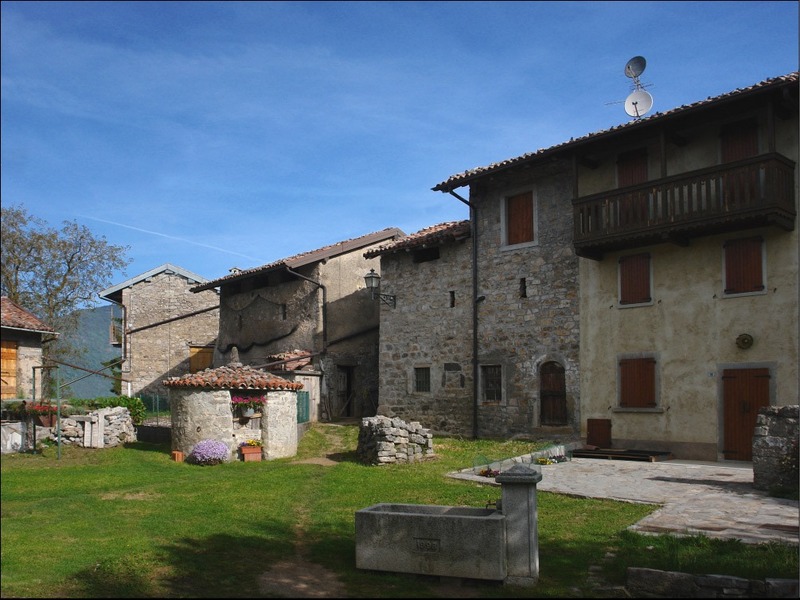 Cavaglia, situated 835 metres above sea-level, is a small centre of houses very close to each other, on a wide plateau which, on one side, faces the Brembilla Valley below and the towns Roncola and Albenza, and, on the other side, it is framed and protected by its mountains. The name "Cavaglia" comes from a suggestive legend and refers to a posting of the cavalry of Queen Teodolinda, that would also influence the name of the mountain above (Castel Regina, meaning the queen’s castle). Besides, it is told that also the stables of the "Forsèla di Buse" (Forcella dei Busi) and “Passabuna” were used as meeting points. In the fourteenth century, Cavaglia, together with Gerosa, was part of the town and parish of Brembilla. In1442 and until 1779, together with Gerosa, Gaiazzo, Passabuna and Cadelfoglia, it moved away from Brembilla, then coming back to its initial status in 1779 during the Napoleonic period. 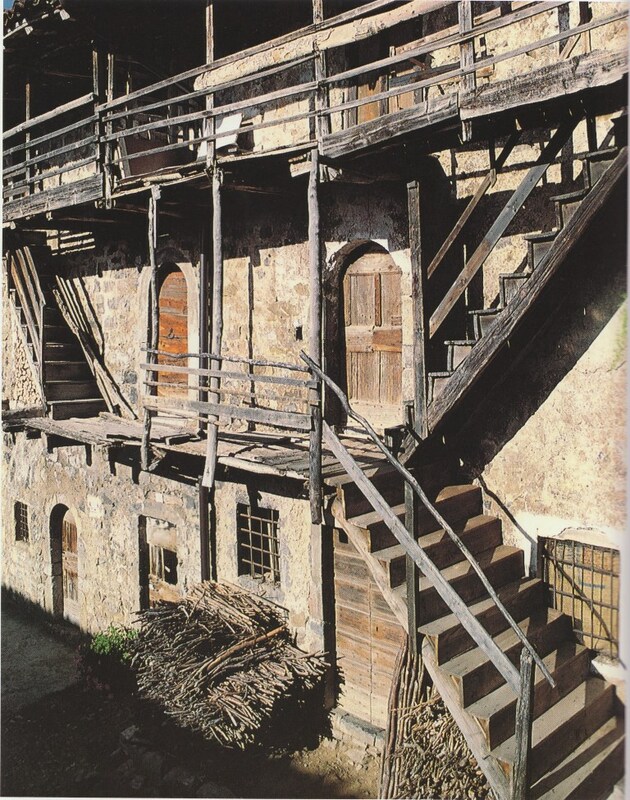 From an architectural point of view, it is worth to have a look at the stone houses characterised by tile roofs, external wooden and stone stairs to go to the upper floors and the so-called wooden ‘lobbie’ (balconies), which were embellished by geraniums in summer. Most doors are arch-shaped and on the stone of one of them the date 1531 is engraved. On the ground floor, you can find stables, kitchens and a room which was presumably an old tavern with the typical ’silter’ceiling made of tufa stone. 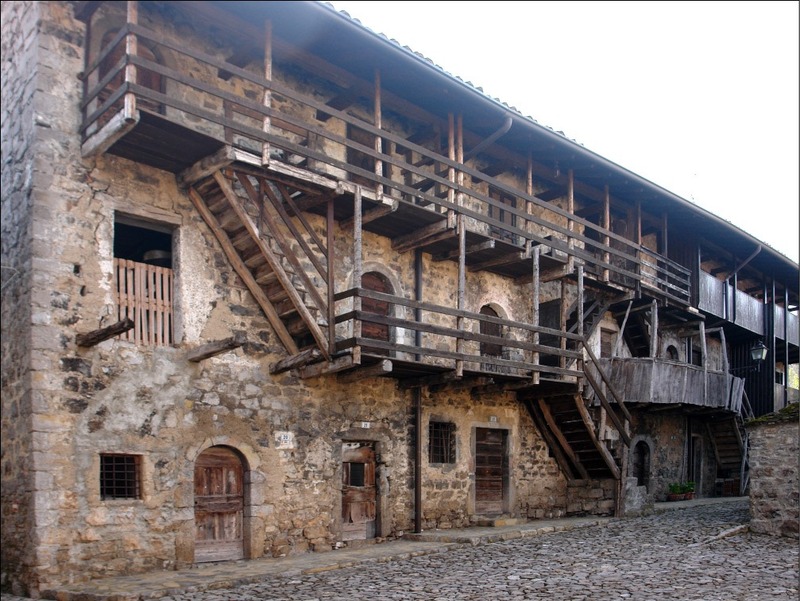 The area has recently been restored in order to safeguard the original architectural features of the peasant centres, in particular a big sixteenth -century house in the middle. 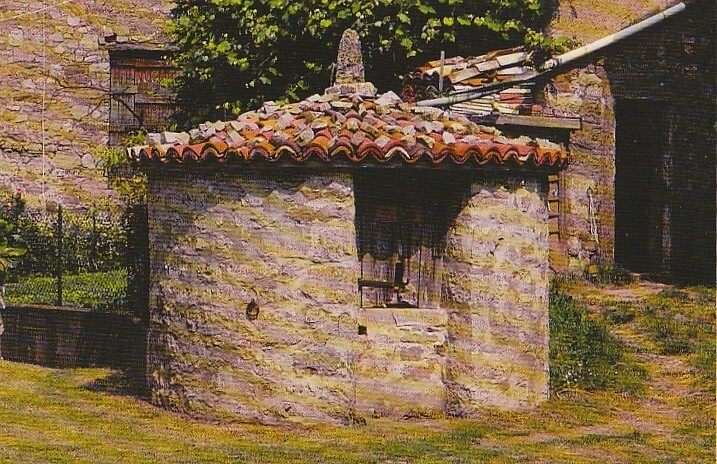 The "sisterne" (tanks, wells) are also interesting; they were typical of the towns of Brembilla Valley and were used for water supply: the rain water was collected in these wells, dug in the ground and tiled in different shapes: circular, square, hexagonal or octagonal, and then covered by sloping or flat roofs and tiled by the typical ‘piöde’. The first one you will meet is right at the entrance of Cavaglia, coming from the mule-track, on the left. Every family had their own ‘sisterna’and most of them are still working nowadays. The one in the centre, near the fifteenth-century house, is still well kept. The small church is also worth a visit; in its Neo-classical style, it is situated on a plateau on the right side of the old centre and it was built in 1901 on the spot where a small temple devoted to Saint Martin already existed. 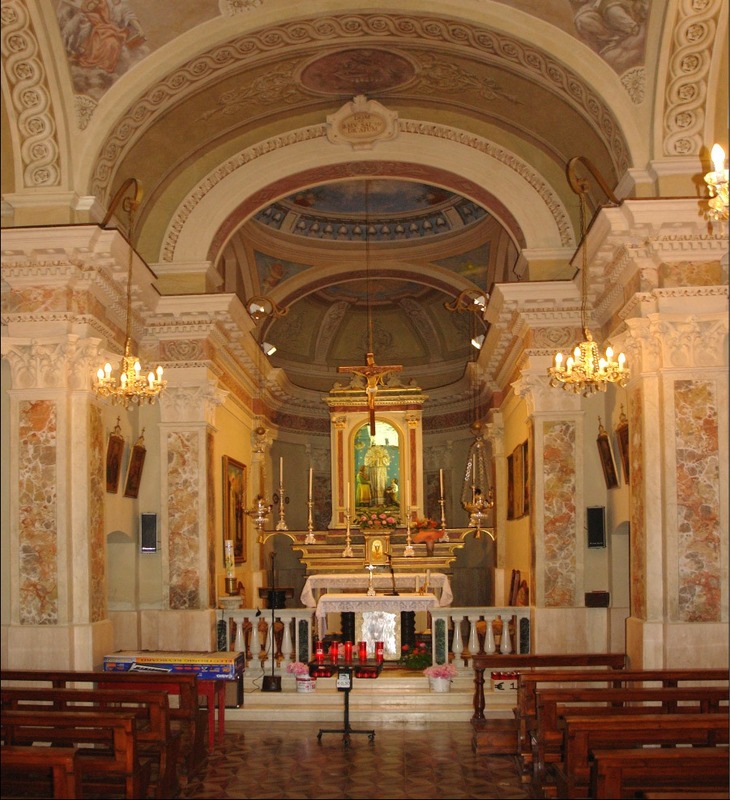 In 1859, the parish priest Pietro Rota decided to build a small chapel consacrated to the Virgin of La Salette, whose painting was brought by the emigrants of Cavaglia coming back from Grenoble in France, where the Virgin appeared in that period. The usual celebration takes place twice a year, on the last Sunday of January and on 15th August and it is characterised by the old tradition of the auction of the throne and the procession of the statue around the streets. A museum of agricultural tools and implements has been staged in the rooms adjacent the church. Visiting and having a look at this collection is a good chance to go back in time and recall some moments of the countryside life of native people of Cavaglia. Cavaglia is a perfect departure point to go hiking in the surrounding mountains. In fact, it is possible to reach the following destinations through the path CAI 596: Corna Camoscera (known as “Còren”), 1343 metres, characterised by white vertical walls of solid limestone stretching for more than 200 metres, Pizzo Cerro, 1285 metres, Castel Regina, 1454 metres, Foldone,1502 metres, path CAI 595 and, a bit further, Sornadello, 1580 meters. We would like to suggest, in particular, the climbing walls on “Monte Còren”, which have been recently restored and nailed by a group of enthusiasts called “Lucertole di Brembilla” and the historical iron wall ferrata of the Virgin open by the group “Amici del Monte Còren” on the south-west of the Corna Camoscera that enables to reach the top. 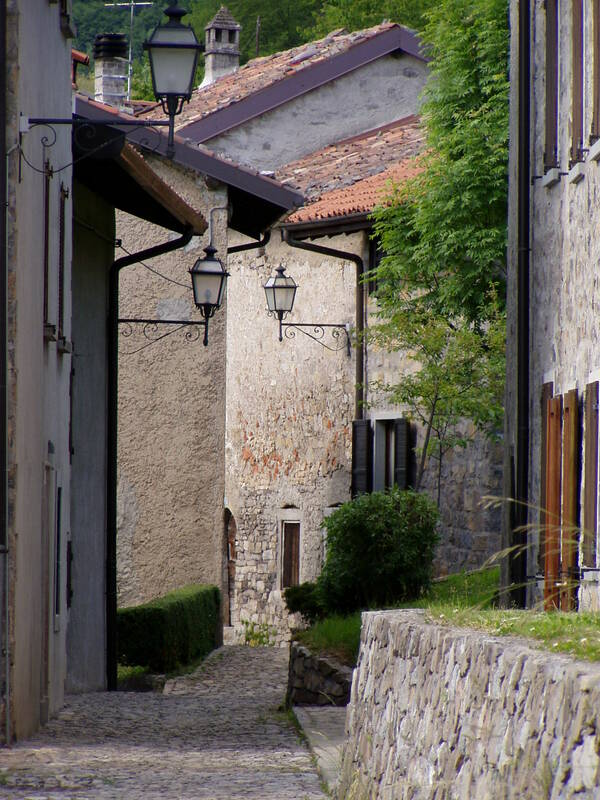 Another interesting path starts from Brembilla, in the area of Capreduzzo, it reaches Cavaglia through path CAI 592 C and then deviates from Gaiazzo to the beech-trees valley, full of springs and the traditional «Calchere», places where the stone was cooked and then transformed into lime. The path finished going down to Cadelfoglia and then back again to Capreduzzo, the starting point.